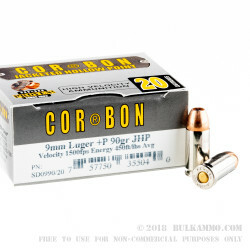 The original hot load manufacturer, Corbon +P 9mm delivers a 90-grain jacketed hollow point projectile at more than 1500 FPS! Designed for use in smaller subcompact 9mm handguns, like the sig P938 or Glock 43, these rounds deliver immense energy transfer upon impact with rapid expansion after penetration. Capable of penetrating up to 15”, these rounds tear through clothing without going through your target. 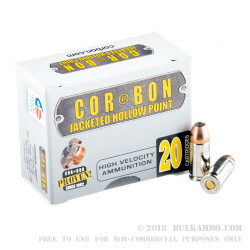 The hollow points themselves feature a gilding metal jacket and a soft lead core, while the jacket is notched on the inside and outside for high performance expansion and uniformity. 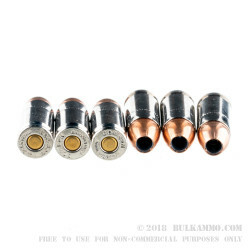 These rounds are loaded into boxer-primed, noncorrosive, reloadable brass cases and come 20 rounds per box. Be sure to check for compatibility with your firearm, as these rounds are rated for +P firearms.